Nemuru is the easternmost town in Japan - the road signs here were also in Russian. 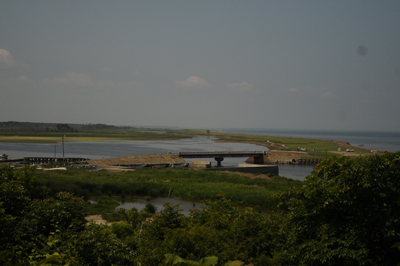 We arrived at lunchtime on 27/7 from Kawayu having changed trains at Kushiro. We were slightly too late to get to Cape Nosappu (22 km) so we decided to walk down to the harbour. The weather was exceptionally hot and sticky and the harbour was rather industrial. Its main redeeming feature was breeding Slaty-backed Gulls with chicks on the roof tops. Both Pelagic and Temminck's Cormorants fishing offshore and many auks passing - but they were too far away to identify. We took a taxi (3000 Yen each way) at 8 am on 28/7 to the visitors centre at Lake Furen (Shunkumital Bird Sanctuary Nature Centre), and walked down to the reserve expecting to be overwhelmed with waders and ducks. There were a few mallard in the channel and two Grey-tailed Tattler on a stone offshore. A large flock of herons and fox completed the picture. 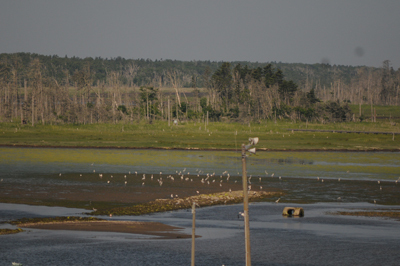 A scan from the bridge revealed an adult sea eagle on the shore and a pair of cranes on the channel. On closer scrutiny, Andrea spotted a small crane chick. 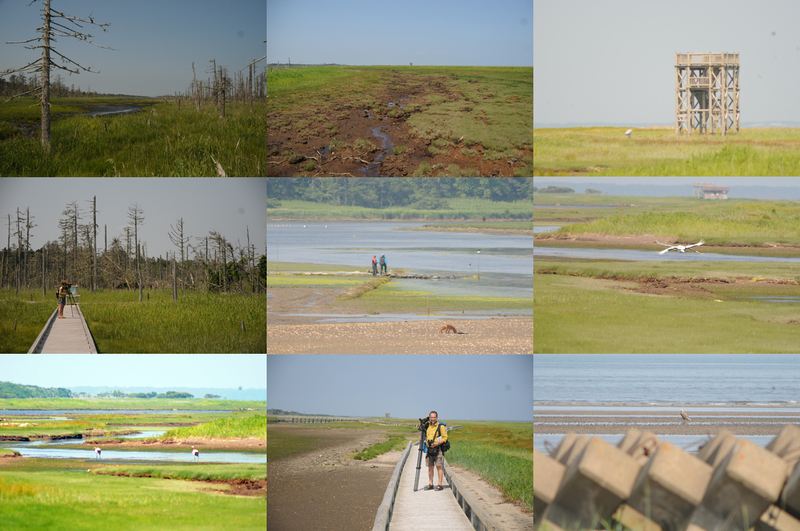 We walked along the spit disturbing several Japanese Skylarks and crossed a bridge onto the reserve island. A second pair of cranes flew passed us and to our luck settled on the channel close by, calling. The island offered few birds, but a singling Middendorff's Grasshopper Warbler and Siberian Rubythroat as well as a Reed Bunting provided some excitement. We visited the visitors centre while we waited for a taxi back to town. This has an updated bird list with pictograms giving both scientific and English names of the birds. 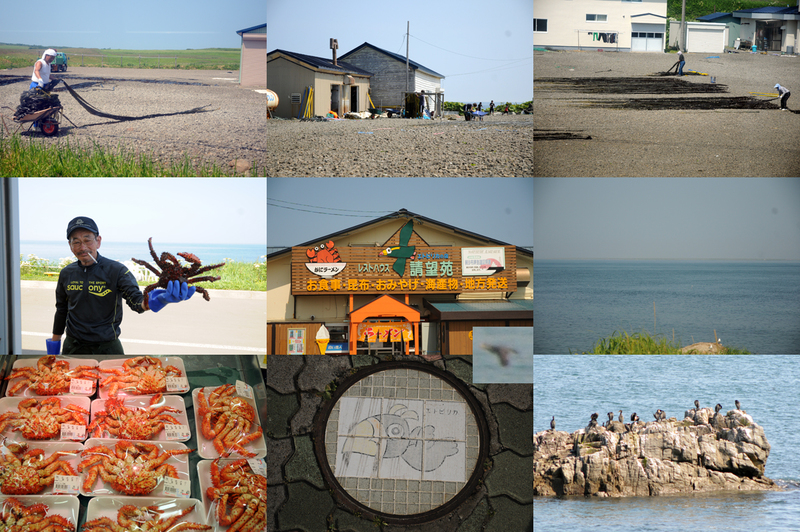 We took the noon bus to Nosappu Cape, overlooking the Kuriles (Northern Territories). There were two species of cormorant and hundreds of Rhinoceros Auklet flying by the lighthouse. A few feeding and a single Tufted Puffin. We also saw seals, dolphins and a small whale at great distance. The trip back to Kushiro on 29/7 gave one fine species: A pair of Lathams's Snipe flew up next to the line parallel to the train for 30 seconds. Oystercatcher Haematopus ostralegus Strandskade 27/7 Nemuru 4-5 on the outer harbour wall. Rhinoceros Auklet Cerorhinca monocerata Næsehornsalk 28/7 Cape Nosappu. Very common. Presumbaly these seen off the harbour too. Tufted Puffin Fratercula cirrhata Toplunde 28/7 Cape Nosappu. A single on the sea with a Rhinoceros Auklet. The redder bill and white head stuck out.